I had just sent an e-mail when Alyas (my three year-old son) came and asked if I would build a castle with him. “Sure,” I said, as I grabbed my coffee cup and headed down stairs. 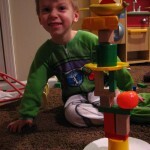 Alyas has been building block castles for months now. However, for the longest time I could never get him to play with them. One day, I decided to build a castle and have him slam into it with his truck. Ever since then, he has enjoyed building castles—except now he is quite adamant about no one knocking them down, which can become a problem with a one year old walking clumsily around. As time goes on his castles have become more completed and detailed. Now upon hear this command from a three year old, I wondered what other parents would have done. Perhaps some would have agreed and removed the plate. Others might have told Alyas to lighten up a bit–likely leaving Alyas in frustration. Still others might have reprimanded Alyas for speaking so harshly to his father. While some of these responses are better than others, I choose to make this a lesson about life. I explained to Alyas (in not so many terms) how it can be fun and beneficial to think outside the box by using his imagination. ‘Creativity,’ I proclaimed, ‘is the spice of life!’ I told him his castles will always be limited if he restricted his building material to only blocks. I challenged him to go get three random toys lying on the ground and build a castle using them. He picked an orange, a plate, and a cup and proceeded to build the castle. The next thing I knew, my son was running all over the basement picking up different toys to see what kind of castle he could make. Just then, one of the seeds of successes had been planted in my son’s soul: The simple principle of learning to think outside the box. Notice how I used the same principle to assist in getting Alyas to play with the blocks. I had to make block building exciting. Before the smashing was connected with the block building, blocks just seemed too difficult. Now the activity was fun. The fact of the matter is the greatest philosophers, theologians, artists, businesspersons, etc are those willing to ‘pock the box.’ These are the people who have the courage to face the unknown. Where others see roadblocks, they see paths. Where others complain, they encourage. While others are pessimistic, they remain optimistic. They don’t just see blocks to build a castle; they see hundreds of items that can be used to assist in building a better, cooler, sounder structure. Yet, many of you are too afraid to think outside of the box when it comes to improving your marriage (or other areas of your life). You have accepted the status quo. You believe nothing will change. You are stuck in a rut. ‘Poor me,’ is your mantra. ‘Everyone is against me.’ ‘I can’t get ahead.’ BLOCKS, BLOCKS, BLOCKS. All you see is blocks. I dare say one of the reasons your marriage (or your life) is on the crapper is because you are not thinking outside of the box. So your spouse won’t listen to you. Well . . . perhaps it is time to stop doing what you have been doing and try something else. Maybe, if you stopped whining and criticising your spouse from the moment he/she gets home, your spouse may just start opening up. PERHAPS, PERHAPS, PERHAPS. There are plenty of ‘perhaps’ you can try to improve this situation. What you need to do is ‘think outside the box’. The same goes for the other areas in your life you wish to improved. Ponder, poke, and strategize on how to do it better. One strategy doesn’t work? So what. Keep going. Keep pushing. Several of Alyas’ choices did not do so well in helping him make a castle. When he started to get frustrated, I reminded him that failure at thinking outside the box is better than failing to think at all. I encourage him to keep going, to think how he could improve the structure to make the object work well with the castle. I was trying to teach him confidence in the mist of failure because he now knew one of the principles of success: TO KEEP THINKING OUTSIDE THE BOX. If you need help in thinking outside the box to improve your marriage, PERHAPS it is time to make an appointment. This is the reason our team is here. Buy Seth Godin’s Pock The Box to get motivated on being creative in all areas of your life. Brandon Wall is Staff Researcher for Heart to Heart Communication and writes blogs on character and parenting for our thrivingcouples.com website. See his complete list of blogs here. He also reports summaries of his research in the area of family studies. See his recent review of David Popenoe’s Families Without Fathers: Fathers, Marriage And Children In American Society and his summary of this research here. His earlier summary of “The Effects of Divorce on Children and Parents” can be found here, “The Effects of Fatherless Children” here and “The Effects of Cohabitation” here.